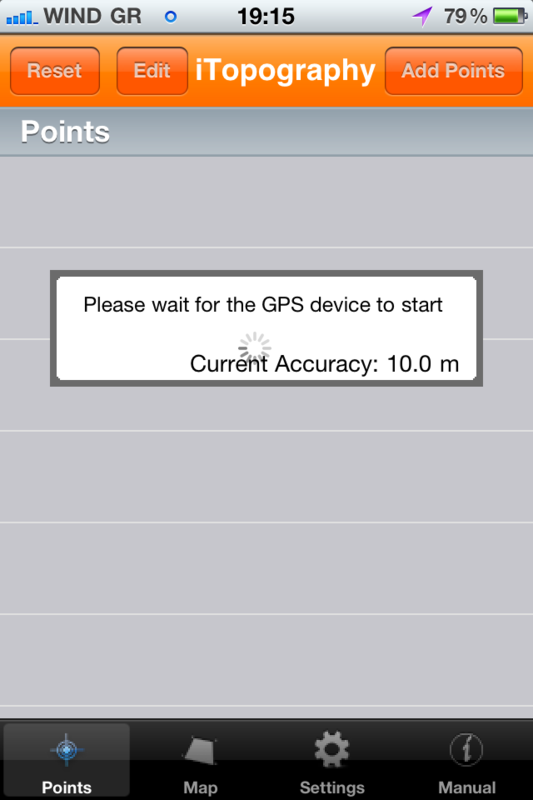 Firstly, the accuracy of the location of a point depends on the signal of the GPS device. 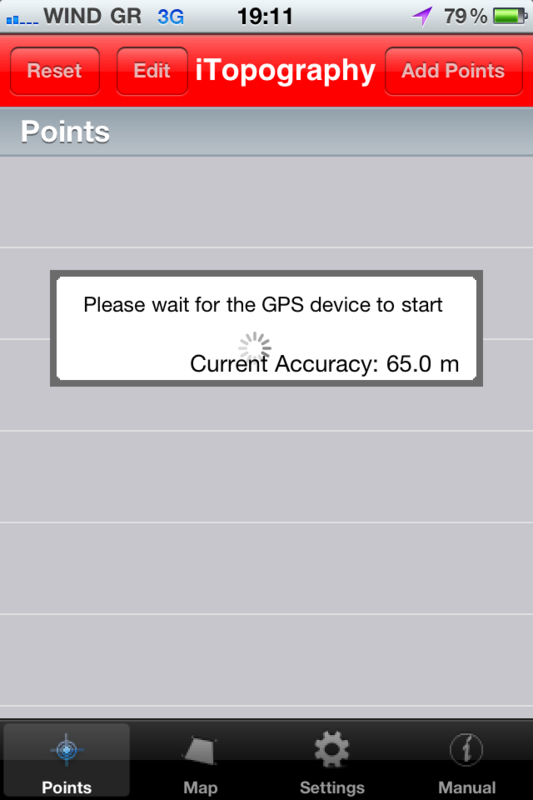 Generally speaking, if there is a 3G signal, the signal of the GPS device is good. Of course, you can control the accuracy from the settings, but if the signal is not good, the accuracy would be as good as the signal is! Every time you want to add a point press the button "Add Point", and wait for the spinning wheel to stop. While the wheel spins, iTopography gathers data from the GPS device, and it checks their accuracy. When the accuracy is less than the one you need or if the number of attempts has exceeded the number you have specified, the wheel will stop spinning. The new point is added to the list, and you may get a warning message informing you about the accuracy of the current point. 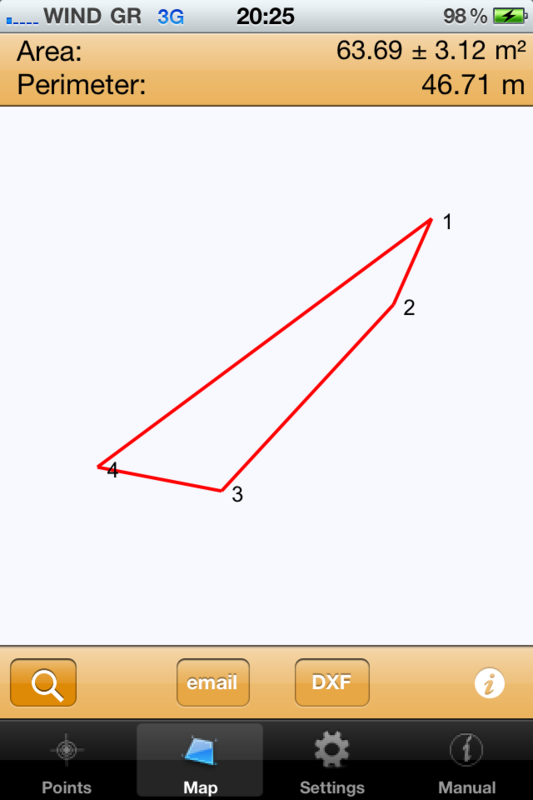 Once you have acquired all the points, switch to the second tab to draw the surface and compute the area and the perimeter. Everytime you start the program or you switch between the tabs, you will see this sign. Here, iTopography is starting the GPS device and is waiting for the accuracy to decrease to the one that you specified in the settings. When you see this sign you can not add any point. Did you notice that the toolbar at the top of the screen is red? This is because the current accuracy is much larger than the one you specified. 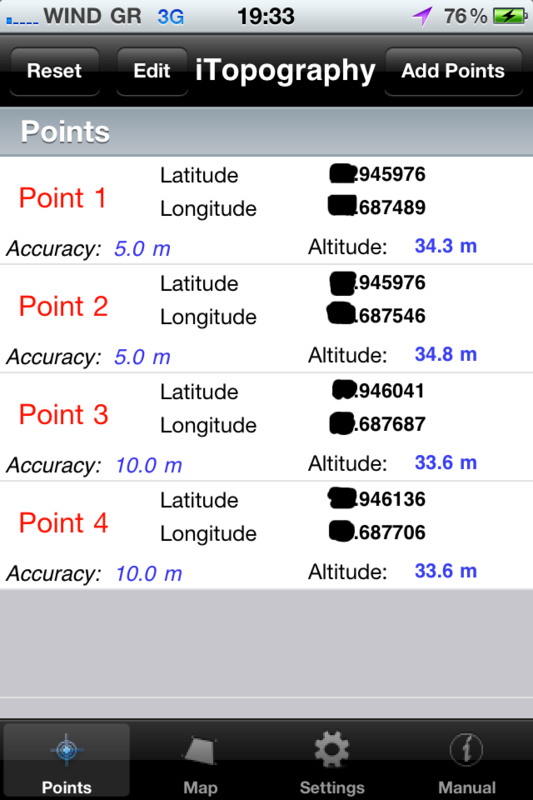 Actually, if the accuracy of the GPS device is larger than twice the specified accuracy, the toolbar will turn into red. If the accuracy of the GPS device is smaller than twice the specified accuracy and larger than the specified accuracy, the toolbar will turn into orange. At this point, you have two options: Either to wait for the accuracy of the GPS device to decrease even further or to increase the accuracy in the settings. We decided to do the second, and increase the accuracy to 10m. Now the toolbar is black, and we can add some points. As we move from one place to another, the color of the toolbar may change (to orange or even to red), but we will be able to add points. Only when we switch tabs we will see the sign in the previous two figures. Did you notice the accuracy? It is only 5m! !